In my previous article I described how to use semaphore in order to synchronise threads or processes. Mutex is a semaphore specialisation and can be used in the special case - when only one thread (or process) is allowed to access shared resource. Mutex is a synchronisation object that controls resource access (critical section execution) by maintaining the knowledge of its current owner (accessor - thread or process). Mutex strictly limits access to a single accessor at a time. When Thread1 acquires ownership of mutex, it has a exclusive right to access the shared resource (to execute the code in the critical section). Once it's finished, it needs to release mutex so another thread can acquire ownership and access the resource. If thread does not release the mutex, other threads cannot acquire it and application is in a deadlock. It is therefore very important to make sure that mutex is released under any condition, no matter of the outcome of the code in the critical section! 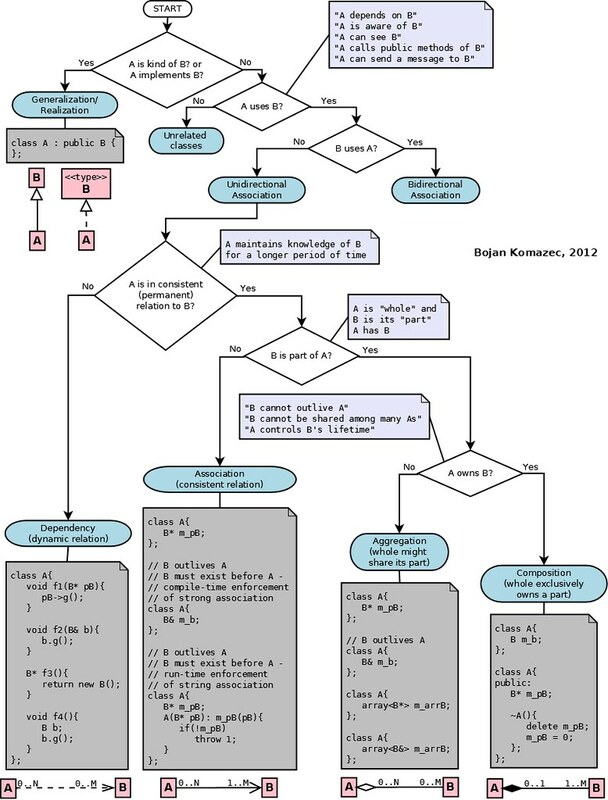 RAII-compliant design can prevent program's execution to leave critical section's scope without releasing the mutex. Semaphore behaves like shared mutex with a count controlled by multiple threads that are allowed to access shared resource. Mutex is stricter, only thread that owns it has the power to release it, and only that thread can access shared resource. Semaphore is a synchronisation object that controls resource access (critical section execution) by maintaining the number (count, n) of accessors (threads or processes) (still) allowed to access the resource. While mutex strictly limits access to a single accessor at a time, semaphore allows up to N (N > 0) parallel accessors. N is defined when semaphore is being created and it represents maximum possible value of the semaphore count. Semaphores are signalling accessors the right of way - just as traffic semaphores, but unlike them, accessors themselves are controlling when the light for others will become green - through wait() and release() operations. Accessors are wait()-ing for a semaphore. If semaphore is signalled (n > 0), wait() returns immediately, decreasing semaphore count. When accessor (this one or any other) is finished with the shared resource it calls release() on the semaphore, increasing its count. Accessor will block on wait()-ing if semaphore is non-signalled (when maximum allowed number of accessors are sharing the resource). As soon as some accessor finishes the work and releases the semaphore, accessor's wait() will unblock and it will be allowed to access the resource. Obviously, if N is set to 1, semaphore (called binary semaphore in this case) logically behaves like a mutex, allowing only one accessor at a time. There is a difference between two of them though: only accessor that locked the mutex can unlock it (mutex is owned by the accessor), but any accessor can release semaphore. Majority of semaphore examples on the internet are focused on consumer-producer problem. I wanted to show use of semaphore on the example of traffic control - something that resembles the real semaphore. So, let's say we have three single-lane, one way roads joining just before a bridge which is one way but has two lanes. 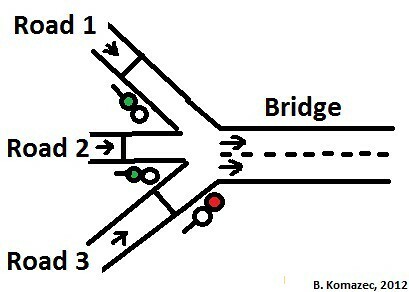 To reduce congestion on the bridge, traffic from only two access roads is allowed at a time. There is a semaphore with the red and green light by the each road and once it turns green, it remains in that state for some time period T. First two opened roads get green light first. As soon as the timeout expires for one of those roads and semaphore shows red, semaphore will show green for traffic that has been waiting at the third road. We can think of roads (traffic on them) as accessors and the bridge as a resource: two roads can lead traffic to the bridge at the same time (two accessors are allowed to access shared resource). Obviously, we will set the maximum value for the semaphore count to 2 in our model. Thread will wait() as long as count is 0 but as soon as it gets increased to 1, wait() returns (decreasing count to 0 again). This example aims to show how semaphore limits parallel access to the shared resource and how accessors (threads in this case) themselves control semaphore by wait()-ing for the semaphore and release()-ing it. To stop threads I tend to use event object - not a flag (volatile bool variable). They are thread-safe and thread callbacks don't need to return with delay of one additional wait() cycle in the case when termination has been requested. I wrapped event and semaphore objects (handles) into RAII-compliant classes - CScopedEvent and CScopedSemaphore. The example above shows how semaphore controls access to the resource by multiple threads. But please note that resource was NOT made thread safe! Semaphore was just allowing up to N threads (2 in our case) to be active at a time (and generate the traffic towards the bridge). If we wanted to limit the number of vehicles on the bridge and to control traffic lights depending on the current bridge load, we would have had to limit the number of active threads to 1. In that case only one road would have green light at a time. If we run simultaneously two or more instances of this process, they will all write into the same file, increasing its size with each write operation. Manipulator endl inserts new line character ('\n') at the end of the line and flushes the buffer to the disk. Obviously, before writing to the disk, our file stream object needs to know the current size of the file in order to move write pointer to the file end. If Process2 appends a new line to the file after Process1 reads file size but before Process1 writes into it, Process2 will increase file size but Process1 will know only about the previous file size and start writing at the position set accordingly, effectively overwriting Process2's last written line! Obviosuly, we need to protect file so only one process is accessing it at a time. We can do that with semaphore or mutex which are shared between multiple processes (and therefore must be named). Note: Although this example uses semaphore for process synchronisation, mutex is here more natural solution - we don't want to limit number of accessors to several (N) but only to 1. Only process that locks the mutex can unlock it and with binary semaphore we are just emulating this behaviour. Mutex or Semaphore for Performance? I tried to find an algorithm which goes through a set of questions (based on aforementioned statements) about the relationship between class A and class B and which at the end yields the name of that relationship. Associations are stronger than dependencies and typically indicate that one class retains a relationship to another class over an extended period of time. The lifelines of two objects linked by associations are probably not tied together (meaning one can be destroyed without necessarily destroying the other). Associations are typically read as "...has a...". For example, if you have a class named Window that has a reference to the current mouse cursor, you would say "Window has a Cursor". Note that there is a fine line between "...has a..." and "...owns a..." (see "Aggregation" later in this section). In this case, Window doesn't own the Cursor; Cursor is shared between all applications in the system. However, Window has a reference to it so that the Window can hide it, change its shape, etc. You show an association using a solid line between the classes participating in the relationship. An aggregation is a special kind of association — a "whole/part" relationship within which one or more classes are parts of a larger whole. A class can be aggregated to one or more other classes. Using aggregation is an excellent way to establish a "pecking order" of complexity, with more complex classes aggregating less complex ones. For a system of any size, doing this can only help viewers of your models more easily understand the concepts that are important to them while enabling them to ignore concepts expressed at lower levels of detail. • The lifetime of the part is bound within the lifetime of the composite — there is a create-delete dependency of the part on the whole. • There is an obvious whole-part physical or logical assembly. • Some properties of the composite propagate to the parts, such as the location. • Operations applied to the composite propagate to the parts, such as destruction, movement, recording. Generalizations are usually read as "...is a...", starting from the more specific class and reading toward the general class. Going back to the Cat and Dog example, you would say "a Cat...is a...Animal" (grammar aside). It is not uncommon to have situation when class A references class B and vice versa. This is known as circular dependency and is resolved by using forward declarations. It is valid and safe to use mutually referenced classes if we initialize references after fully creating classes' instances. But what happens if references are assigned (and probably used) in constructors? Constructor of first class initializes reference to an instance of the second class that is yet to be created...This sounds silly and we can expect all sorts of things - from compile-time and run-time errors to programs running perfectly fine (well, if we are lucky enough...). References can be implemented as pointer or reference types. We had to pass 0 to S1 constructor as s2 had not yet been declared nor created. This makes S1 constructor to raise access violation exception when it tries to dereference m_pS2 in order to call S2 methods. A simple fact that we cannot have a reference (or address) of the object that hasn't yet been created leads to conclusion that it is impossible to create instances of mutually dependent classes where references must be initialized in constructor. But there is one case when this is actually possible. Possible but not safe. If these structures are members of another (container) structure, it is possible to initialize references in container's constructor initializer list. One additional note: it is always a good practice to decouple classes (break dependencies between them) as much as possible. This is usually done by using interfaces or some other patterns (e.g. Observer pattern). In a perfect world, compiler should be able to detect all errors in the code. If types mismatch or value is out of the valid range - compiler should complain. How can we help compiler to achieve this? One answer is: by defining our custom types. This code compiles fine but it sets variable to a value out of the valid range and this can lead to some logical errors. SetLevel(2) will cause compiler to report an error. NOTE: enum value is implicitly casted to int but int value must be explicitly casted to enum type.